If you can't trust those in charge, who can you trust?From government to business, banks to media, trust in institutions is at an all-time low. But this isn't the age of distrust--far from it. 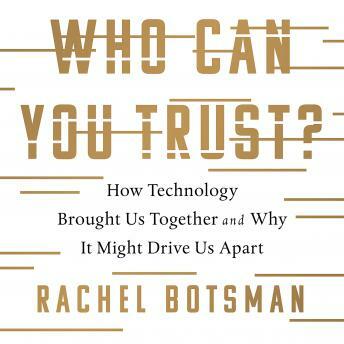 In this revolutionary book, world-renowned trust expert Rachel Botsman reveals that we are at the tipping point of one of the biggest social transformations in human history--with fundamental consequences for everyone. A new world order is emerging: we might have lost faith in institutions and leaders, but millions of people rent their homes to total strangers, exchange digital currencies, or find themselves trusting a bot. This is the age of 'distributed trust,' a paradigm shift driven by innovative technologies that are rewriting the rules of an all-too-human relationship. If we are to benefit from this radical shift, we must understand the mechanics of how trust is built, managed, lost, and repaired in the digital age. In the first book to explain this new world, Botsman provides a detailed map of this uncharted landscape--and explores what's next for humanity.